The Geezer Ride started at Prairie Grove Park, where the GTDRI started last year. Many locals might know this park better by its old name, "Dinosaur Park" because back in the day there was a large cement statue of a brontosaurus there. That park is about six miles from the house, so my Geezer Ride started at 11:00am to give me the time to cover those six miles with time afterward to sit a bit before the planned noon time start. I need to be a good host and all! I took a nice, easy pace getting there on the Pofahl single speed. I was geared 37T X 18T so it cruises okay on the flats. The day was perfect. Even the wind, which was stiff at probably 20mph out in the country, was from the "mostlyWest", maybe a bit from the Northwest, so going into that to begin with on fairly flat roads would be nicer. The only way it could have been better was if it would have been a Southwest wind. Oh well! At least it was not humid at all and the air temperature was climbing to a nice and comfortable 80°F for the bulk of the ride time. There were few folks already at the park when I pulled in and we had more arriving. To start out with, there were eight of us: Ken from Pella, Shannon from Pella, Martin from Williamsburg, Aaron from Little Rock, Arkansas, Josh from Burlington, Ross from Cedar Falls, Robert from Cedar Falls, and myself. Yes, there were 9 in the end, but not to start out with. Shannon (L) and Ross. Bike Iowa represent! I said a few words and we were off. The ride started by going up the bike path to the West on Shaulis road. As we did, I spied a car with a fancy looking rig on the back. Perhaps a Fargo? Hmm....... Maybe someone was late? Oh well..... We were off and running down Aker Road before we knew who it might be. As I related in my post for the recon of this route last weekend, there was a lot of fresh gravel, and that was also the case yet for this ride. 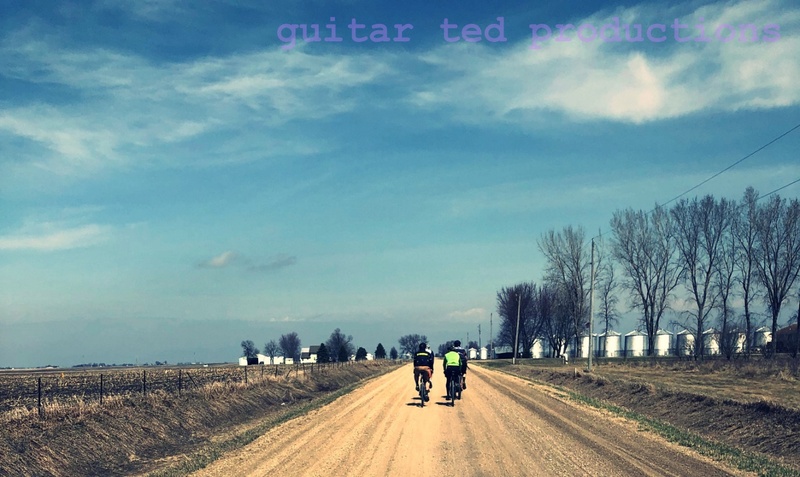 Headwinds and fresh gravel! Oh yeah! Everyone seemed to be ignoring that though, given the amount of chatter I was hearing from those in attendance. The route took us down Holmes Road eventually and we entered Hudson on the pavement from the West where a driver gave us the "angry throttle" as they passed us and went speeding off into the distance. Whatever! (L-R) Robert, Josh, and Shannon heading Southwest on Eldora Road where we picked up #9 and a flat tire. There was anticipation amongst the riders for our "mid-ride" stop at the Broad Street Brewery in Reinbeck, Iowa. I was a bit concerned that our pace was going to deliver us there too early for the brewery's opening time of 2:00pm. Those concerns all went out the window due to a couple of events which occurred just Southwest of Hudson on Eldora Road. The first of those was a phone call from my wife. All the riders respectfully stopped as I took the call which was about meeting some friends after the ride. So, with that small interruption out of the way, I figured we wouldn't have to wait so long now for the brewery to open. However; as we were sitting there, someone pointed out that there was a bicyclist coming up the road. I strained my old eyes to see up the road and discerned a figure riding a bicycle which resembled the one I saw on the back of the vehicle just after the ride's start. Sure enough, it was Ray from Des Moines, who had indicated that he had intentions of making the ride. He was indeed on a Fargo, but a new one with the 27.5" X 3" tires and nice carbon Whiskey rims. Pretty blingy. So, since Ray was out of breath from time-trialing it to catch us, we delayed just a bit more to allow him to recover. We no sooner got going again, had just crossed into Grundy County and over the Black Hawk Creek bridge, when someone behind called out "Flat tire!". So, I pulled over and as I looked back, there was a lone figure on the bridge. It turned out to be Ross, and he punctured on a sharp shard of limestone that looked like a tooth. Several of the guys joined Ross on the bridge deck while I waited ahead with the remainder of the group. This delay certainly would put us in to Reinbeck well after 2:00pm, so now there was no more concern at all about getting there too early. After Ross got his Ogre back up and running we took off and then headed South on V Avenue toward Reinbeck. The final approach was on the Pioneer Trail in to town. Robert and Martin missed the turn, and since they were so far ahead, I couldn't yell at them to stop and go left. Instead, they reached HWY 175 and went in to town that way. As we rounded the corner on Main Street to Broad Street we saw something that we all found surprising and rather pleasant. There was a barbecue competition going on in front of the Broad Street Brewery complete with cask beer on tap. We saw several pop up tents and smokers going full steam. There were lots of people milling about, (considering this was a rural town in Iowa, it was a lot of people), and there were already lines of motorcycles and bikes parked along the street. The Cedar Vallet Cyclists road riders were there already in deep in to their cups of beer, lounging in the bright afternoon Sun. Our little group integrated in with no issues and we had a really nice time there. Extraction was going to be difficult, as our group was enjoying the beers on hand and the food which was completely unexpected. I couldn't have scripted a better mid-ride stop, and it was totally all by chance that we had as much fun as we did. That's why you have to come to these rides. You never know what might happen along the way! Eventually we peeled ourselves slowly from the bar seats and booths, remounted our bicycles, and slowly made the left turn on to Main Street leaving all the frivolity behind. Reaching the turn to start heading East and then eventually back North again. The Sun was heating things up by now and the wind had not relented, but now seemed to have a Southwest component to it, which kept coming around so that by the time we finished it was a quartering tailwind. Again, I could not have asked for better conditions. But first, we all had to navigate the three mile stretch of Level B Road on 110th in Tama County. At the start of our Eastward trek on 110th's three mile stretch of Level B Road. The Level B stretch went by without incident and then it was North up P Avenue, eventually back in to Black Hawk County where the road becomes Lincoln Road. It was getting on into the late afternoon by now and I was feeling tired, pushing my single speed gear up one roller and then another. Apparently Aaron was feeling that as well, since at a stop to cross a county road he rolled up to tell us he was done and was going to slow roll it back to wherever it was he was staying at for the weekend.He had a cell phone, so I figured that he would be okay. We bade him farewell as the remaining eight of us headed back up North. Eventually we reached Holmes Road and Robert, Martin, and Josh were on a "breakaway" which ended up leading them past the somewhat obscured and unmarked entrance to Petrie Rd. That was where they should have turned right, but they all rolled right on past. The rest of us stopped to wait, and wait..........and wait! Finally Robert appeared and a bit later after that Martin and Josh came back to us. Then we tackled Petrie Road. Eventually the "Bonus Miles" club members came back to us. Petrie Road proved to be challenging. It almost always is. I tell folks it has "a little bit of everything" when it comes to Level B Roads, all packed in to a mile. This is pretty much the only through Level B road in the county, that is not a dead end, so that it has such variety is a nice bonus. Thanks to all who came out to ride. I had a great time with you all!